I have a Stay-Rite Max-E-Therm 400HD. I have been replacing parts as it would run for a while and then quit. Today I removed the HSI to replace and noticed half the tip of the HSI was submerged in WATER!! Do I disassemble the manifold and replace o-ring seals or check for a cracked manifold? Remove one of the bottom header bolts and see if water comes out. If water comes out there then you have an issue with the heat exchanger. Replacing the heat exchanger is not an easy job. Just because you have cupro nickel heat exchanger doesn't mean that it's bullet proof. If you let your pool chemicals go with out keeping them in check for long periods of time it will eventually eat thru it. Cupro nickel with just take longer. So remove one of the bottom bolts on the header and check for water there. Nevermind the finger, see the 4 bolts lined up vertically? Remove the lowest one to check for water. I removed the lower bolts and about 10 gallons of water drained out. I removed the entire manifold and took some photos. I put my mouth on the copper loops and pressure tested each loop. No leak detected by mouth. Perhaps there is a pinhole leak that I can't detect that way. Other than an undetected pinhole leak in the heat exchanger, is there any other way for that much water to enter the combustion chamber? Before doing this I had removed the HSI with the pool pump running and could see water in the combustion chamber but the amount of water was not increasing. If there was an active leak in the heat exchanger I would expect the pool pump to pump full the combustion chamber and then overflow. This was not happening, but the water got in there somehow. ???? Noticed the corrosion on a couple of the bolt heads. Those bolts were the bottom 2 bolts holding the manifold on. I don't see any malfunction of the internal bypass valve or the thermostatic bypass valve. No cracks in the manifold that I can detect. So thinking the combustion chamber was most likely damaged when flooded, I pulled it apart. Looks like a mess. Any advice which parts to replace and which to keep? I'm thinking new heat exchanger and o-rings PLUS new combustion chamber pan. Anyone have any recommendations for the vertical cylindrical mesh tube that delivers the gas? Keep or replace? Seems like the manifold tubing in your first picture looks okay, if it was just a chemistry issue these would show a lot of damage. Looks more like you have a lot of sooting going on probably from low gas pressure. Whether you fix or replace this heater I would do a gas pressure test before You fire it up. Can't really see the gas line leading to heater, what is the yellow flex line going to? The yellow flex line is about 24" long and connects the gas. I have a pressure meter, but not familiar with where to take the pressure measurement. I will inspect the gas line coming out of the ground. It's 1.5" metal pipe and corrodes every few years from rain and I replace it. 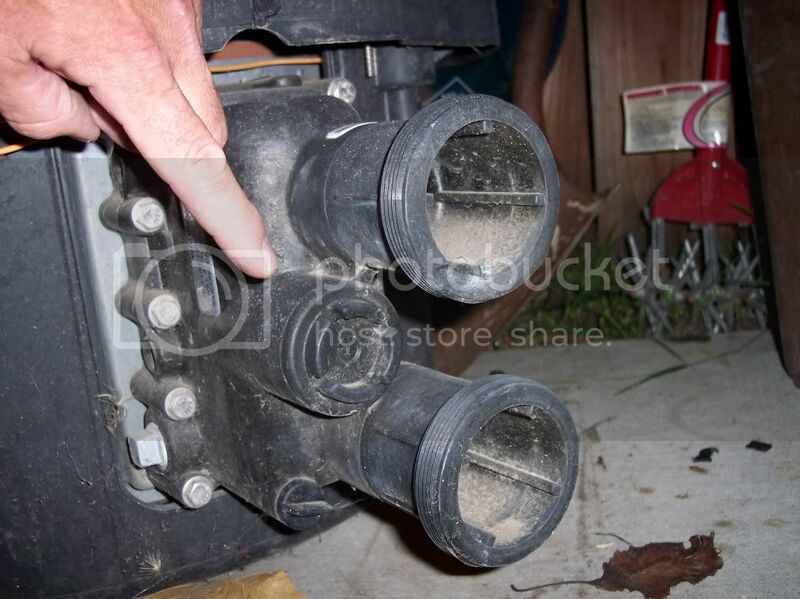 You have a leak in the heat exchanger and that needs to be replaced. Blowing into the tubes won't even come close to the pressure that is put thru the system. Have you priced out all the pieces and parts? The flex line isn't code as they are made for indoor appliances. I would also replace that and use hard pipe as per code. Had same issue with first heater I had -- after several years it failed with water inside -- took apart and took manifold to a radiator shop and for $50 they fixed the hole and cleaned it -- worked another 2 years. Since the heat exchanger appears to be in good condition, I am taking it to a radiator repair shop to have the leak fixed and pressure tested. Should be much cheaper than a new cupric-nickel at $1500 or a copper at $700. I will see if I can test the NG pressure too. Unfortunately, that heater is done. Look at the center of the picture along the right side. See that hole? That tub cannot be run like that or repaired. That will allow hot gasses to escape through it, and maybe "blowtorch" a bigger hole and perhaps even an exterior fire. Even if that hole wasn't there, that tub is in real bad shape. Pinhole leaks, (95% of exchanger failures) take a long time to fill the tub up. You definitely won't visually see the water level rise. Not sure if a radiator shop fix (with i'm guessing solder or brazing rod) will be able to withstand the temps that are subjected to the exchanger. I suppose you could try it, but like i stated, the tub wont last in its present condition. As stated above, what ever you choose to do, you should check the gas line sizing. Pool Clown is right. I know I would never ever suggest to a client to repair such a unit. But many DYI folks feel differently. If you add up your time and costs, you're at a new heater. Plus any added frustration that comes along after you repair and there are other issues. As a person in the industry from a liability aspect I would never suggest to anyone to repair any part of this heater. Should anything happen you would have a lawsuit on your hands. I agree, replace the heater. Also, the question comes up, why did this one fail, especially if it's not that old and has a cupro nickel heat exchanger? If the unit is that young as stated, 2-4 years old, then you either have poor water management. I have always stated that you can spend the extra $$ on cupro nickel and it won't mean a darn thing if you don't maintain your water correctly. It will fail just like regular copper but will just take a little longer. These units also need the correct gas pipe sizing. These are not as forgiving as say the Raypak. Mostly because it is a closed burner chamber. Unless you pressure test the heat exchanger you might find it hard to find the leak(s). But any case, I would not recommend repair but to replace it. But it's not my pocket book taking the hit. I've had customers beg me to repair it to just give them "one more season" then they will buy a new one. Well I fell for that line many times but when they call you next season and ask the same thing, well I won't do it.